During the 2011 Assembly elections in Kerala, outgoing chief minister and veteran CPI(M) leader VS Achuthanandan had described Rahul Gandhi as an ‘Amul baby’, meant to convey as someone who was immature and inexperienced. On Monday, a day after Gandhi was announced as the Congress candidate from Wayanad parliamentary constituency, the 95-year-old leader repeated the charge through a Facebook post. I was Prompted to write this Article analysing the same asper Astrology after reading the above. Placed in the 10th house has already rewarded him the position as the Congress President after Venus reached the Venus in the 10 house as per declination, Now No substaintal gains can be seen for him. On the Start of the Election Day Venus in Transit will be in the 4th house and on the day of the Results of the Elections Venus will be in the 7th house of Opponents. Lagna is Vargottam in the 4 Charts below and is good . Also Ketu Promises 80 % which indicates that the native is born to Rich, Strong and Parents having a high status as per the D12 Dwadamsha chart . He is born on the Friday and the Day Lord is Venus placed in the yama of Virgo its debilitation sign and the Yama Lord Mercury is placed in the 8th house shows the weakness of Day Lord and the Venus in his chart. Placement of Venus in the 10th house again shows High status but since the depositor is placed in the 6/8 axis there may be loss of the Power and Prestige . From the above we can make out that the D12 the Dwadamsha Chart for the Parents is the Strongest and hence the Native is Born to very Strong Parents with power and Prestige since the Lagna of D12 is Vargottam, the Lagna Lord Venus is also Placed in the Lagna who is the Anter Dasha Lord and Lord of Fructifications as per Garbshishta and also well placed from Venus the Anter dasha Lord . Ketu the Dasha Lord is very strong in all the Chart further shows that the Promise in the Chart is Very Strong, but since the Anter dasha Lord is weak in the remaining 3 Varga charts shows the weakness of the native Losing strength in the Rashi Chart since the dipositor Moon is placed in the 6/8 axis with Venus ,and being the Day Lord Placed in the Yama of Virgo the Sign of debilitation and the yama lord of the day Mercury placed in the 8th House of the Rashi Chart, Debilitated in Navamsha and a parallel position in the Dreshkanne chart showing our Poorva Janma Karma..
Career of the Native as per the Jyotish Shastra with unique techniques. 10th house from Moon Mental condition is again Mercury and the 9th and the 10th Lord from Moon are again in 2/12 axis, in both cases the 9th from Lagna and 10th from Moon is Mercury and placed in the 8th house from the Lagna and in the 6th from Moon are the most malefic combinations for a good Career . Saturn is weak since in debilitation, it is also the Yoga Karka planet but not a Poorna Yoga Karka since not the Lord of the 9th and the 10th house . Saturn is in the 3rd Dreshkanne and placed in Durvasa – Hot Tempered, Egoistic, Orthodox and follower of Traditions, no patience, inflicts great harm. .
Saturn is debilitated but placed in the 7th house is digbali and since in Satwik Dreshkanne the aspect is good on Sun and Mars , but bad for Father . The Relation of Saturn with 6th Lord Jupiter is not good since it gives dispute and imprisonment . Saturn should be strong in the Rashi, Dreshkanne and the Dwadamsha Chart . It is strong in the D12 Dwadamsha chart in own house , and since placed well in this chart they need not work and will get the Promotions very easily. This has Proved on dot . Saturn is related to the 2nd and the 11th Lord in the 9th house . The fame and recognition come from this combination but unfortunately the Depositor of these 2 planets is in the 8th house spoils all the fame and the recognition. In the navamsha Chart Saturn is weak. In the Dashamsha Chart Saturn is in the sign Sagitarius the the Sign Lord Jupiter is placed in the Lagna of the Natal Rashi Chart who is the 3rd and the 6th Lord most malefic for libra Lagna. MCL of the 10th house is Mercury and placed in the 8th house , well placed from the Garbshishta planets but ill placed from Saturn, Sun and Mars and hemmed between Saturn and Mars . Hence the native may face bad situations in the professional career like imprisonment. 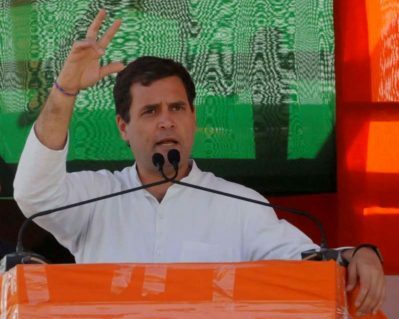 Rahul Gandhi though born to very rich parents with high status and Power may not be able to reach the level of his parents it so seems from the above analysis , he is on the losing side of the table though he may gain some upper hand this year , which also he may not be able to sustain it in a long run. The Fate of Congress is at Stake it so seems from his Natal chart. This is total Astrological analysis and not my Personal Opinion.